We found 197 results matching your criteria. MaylineÍs original flagship products set the standard more than 70 years ago - a unique product family bringing our drafting heritage into today's modern workplace. Established in 1939 as the Engineering Supply Company, Mayline has come a long way from its expertise in DRAFTING TABLES, BLUEPRINT FILES, MUSEUM FILES, and STRAIGHT EDGES. The war years capitalized on our high quality and precision manufacturing for providing highly accurate navigational and mapping accessories for all branches of the military. Mayline's Blueprint, Plan, and Museum files are available as standalone units, interlocking systems, and highly protective solutions for museum quality documents and artifacts. Mayline Drafting and Drawing Tables - Made in America. Mayline's Drafting and Drawing Tables. Mayline's Vertical Files - Vertical file wall rack with hangers and clamps, the ideal choice for vertical hanging file storage. Drawing Vinyl 24" x 30"
Drawing Vinyl 30" x 36"
Drawing Vinyl 30" x 42"
Drawing Vinyl 37 1/2" x 48"
Drawing Vinyl 37 1/2" x 60"
Drawing Vinyl 37 1/2" x 72"
The Roll File Carts has 2" poly dual wheel non-scarring casters. There is an insert included to accommodate various size rolled documents. It has a wire construction, and an easy, no tools required assembly. It comes in black finish only. The Roll File Carts has 2" poly dual wheel non-scarring casters. There is an insert included to accommodate various size rolled documents. It has a wire construction, and an easy, no tools required assembly. It comes in black finish only. Mayline - Drawing Table - Futur-Matic Height Adjustable Table - 30" x 42"
Mayline - Drawing Table - Futur-Matic Height Adjustable Table - 37 1/2" x 48"
Mayline - Drawing Table - Futur-Matic Height Adjustable Table - 37 1/2" x 60"
Mayline - Drawing Table - Futur-Matic Height Adjustable Table - 37 1/2" x 72"
Mayline Office Furniture All Steel Plan Files feature rugged steel construction, choice of flush or raised bases, stackable convenience and the capacity to store three standard sheet files. Interlocking steel plan files are designed for ease of stacking. All Steel Plan Files feature rugged steel construction, choice of flush or raised bases, stackable convenience and the capacity to store three standard sheet files. Interlocking steel plan files are designed for ease of stacking. All Steel Plan Files feature rugged steel construction, choice of flush or raised bases, stackable convenience and the capacity to store three standard sheet files. Interlocking steel plan files are designed for ease of stacking. Mayline self-contained Museum Files have integral cap and can be bolted together for stacking. Drawers have front metal plan depressor and rear hood to keep documents flat and orderly. Mayline self-contained Museum Files have integral cap and can be bolted together for stacking. Drawers have front metal plan depressor and rear hood to keep documents flat and orderly. Mayline self-contained Museum Files have integral cap and can be bolted together for stacking. Drawers have front metal plan depressor and rear hood to keep documents flat and orderly. All Steel Plan Files feature rugged steel construction, choice of flush or raised bases, stackable convenience and the capacity to store three standard sheet files. Interlocking steel plan files are designed for ease of stacking. Mayline - Professional Drawing Kits - Woodgrain 15" x 20"
Mayline - Professional Drawing Kits - Woodgrain 18" x 24"
Mayline - Professional Drawing Kits - Woodgrain 30" x 42"
VQV Discount Office Furniture The perfect design solution with an angled and horizontal worksurface all-in-one project table. With LPL and HPL laminate choices and a large horizontal surface to accommodate a laptop and/or keyboard the Mayline Ranger Split Top Project Table is a unique product bringing together Mayline�s drafting heritage into a modern workplace. The perfect design solution with an angled and horizontal worksurface all-in-one project table. With LPL and HPL laminate choices and a large horizontal surface to accommodate a laptop and/or keyboard the Mayline Ranger Split Top Project Table is a unique product bringing together Maylineês drafting heritage into a modern workplace. The perfect design solution with an angled and horizontal worksurface all-in-one project table. With LPL and HPL laminate choices and a large horizontal surface to accommodate a laptop and/or keyboard the Mayline Ranger Split Top Project Table is a unique product bringing together Mayline�s drafting heritage into a modern workplace. The perfect design solution with an angled and horizontal worksurface all-in-one project table. With LPL and HPL laminate choices and a large horizontal surface to accommodate a laptop and/or keyboard the Mayline Ranger Split Top Project Table is a unique product bringing together Mayline�s drafting heritage into a modern workplace. The perfect design solution with an angled and horizontal worksurface all-in-one project table. With LPL and HPL laminate choices and a large horizontal surface to accommodate a laptop and/or keyboard the Mayline Ranger Split Top Project Table is a unique product bringing together Mayline�s drafting heritage into a modern workplace. Maylineês Ranger Team Table is the perfect solution for project or other team meetings. The Team Table has the same great strength and quality as our standard Ranger drafting table which is the result of years of experience in the drafting industry. A variety of storage under the standing height table can house project or meeting materials. Perhaps the strongest drafting table on the market, this Mayline Ranger Steel Four-Post Table is the workhorse of the industry. Maylineês Ranger Team Table is the perfect solution for project or other team meetings. The Team Table has the same great strength and quality as our standard Ranger drafting table which is the result of years of experience in the drafting industry. A variety of storage under the standing height table can house project or meeting materials. Mayline Self-contained steel C-Fileså have integral cap and can be bolted together for stacking. Drawers have front metal plan depressor and rear hood to keep documents flat and orderly. High base designed to support one file. Drawer pulls are chrome. Files stack five high on flush base. Files stack two high on base legs. Mayline Self-contained steel C-Fileså have integral cap and can be bolted together for stacking. Drawers have front metal plan depressor and rear hood to keep documents flat and orderly. High base designed to support one file. Drawer pulls are chrome. Files stack five high on flush base. Files stack two high on base legs. Mayline Self-contained steel C-Fileså have integral cap and can be bolted together for stacking. Drawers have front metal plan depressor and rear hood to keep documents flat and orderly. High base designed to support one file. Drawer pulls are chrome. Files stack five high on flush base. Files stack two high on base legs. Mayline Self-contained steel C-Fileså have integral cap and can be bolted together for stacking. Drawers have front metal plan depressor and rear hood to keep documents flat and orderly. High base designed to support one file. Drawer pulls are chrome. Files stack five high on flush base. Files stack two high on base legs. All Steel Plan Files feature rugged steel construction, choice of flush or raised bases, stackable convenience and the capacity to store three standard sheet files. Interlocking steel plan files are designed for ease of stacking. Perhaps the strongest wood drafting table on the market, this Mayline Four-Post Table is the workhorse of the industry. It is extremely stable and features a tiltable work surface up to 50 degrees from horizontal. Perhaps the strongest drafting table on the market, this Mayline Wood Frame Table is the workhorse of the industry. WOOD FOUR-POST DRAWING TABLE A natural complement to the Ranger drafting tables, these attractive wood tables look great in any environment and coordinate well with our Wood Plan Files. Perhaps the strongest drafting table on the market, this Mayline Wood Frame Table is the workhorse of the industry. Perhaps the strongest drafting table on the market, this Mayline Wood Frame Table is the workhorse of the industry. WOOD FOUR-POST DRAWING TABLE A natural complement to the Ranger drafting tables, these attractive wood tables look great in any environment and coordinate well with our Wood Plan Files. Mayline Drawing & Drafting Table - Stoway - 30" x 42"
The Art Tables have drawing boards have thermally fused low-pressure laminate in white finish. The tables are shipped knocked down. Save up to 70% on Mayline Economy Ranger Steel Four-Post Drawing Tables and Drafting Tables. Perhaps the strongest drafting table on the market, this Mayline Ranger Steel Four-Post Table is the workhorse of the industry. Save up to 70% on Mayline Ranger Steel Four-Post Drawing Tables and Drafting Tables. 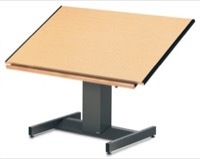 Save up to 70% on Mayline Ranger Steel Four-Post Drawing Tables and Drafting Tables. Perhaps the strongest drafting table on the market, this Mayline Ranger Steel Four-Post Table is the workhorse of the industry. Mayline Plan Files Mayline B-Files are perfect for plan document storage and structurally provide the greatest protection of any plan file on the market. Perhaps the strongest drafting table on the market, this Mayline Ranger Steel Four-Post Table is the workhorse of the industry. Perhaps the strongest drafting table on the market, this Mayline Ranger Steel Four-Post Table is the workhorse of the industry. Perhaps the strongest drafting table on the market, this Mayline Ranger Steel Four-Post Table is the workhorse of the industry. The Ranger Steel Four-Post B Combination has a drawing board with thermally fused Birch wood grain low-pressure laminate with steel end cleats only. It includes a paper apron. The Table also has a tool drawer and a shallow plan drawer. The tool drawer comes with an insert tray and a lock with two keys. The shallow plan drawer has convenient storage for papers and reference materials. The table is shipped knocked down. Quantities are limited to 5 of any model per order. Perhaps the strongest drafting table on the market, this Mayline Ranger Steel Four-Post Table is the workhorse of the industry. Perhaps the strongest drafting table on the market, this Mayline Ranger Steel Four-Post B Combination Table is the workhorse of the industry. Perhaps the strongest drafting table on the market, this Mayline Ranger Steel Four-Post B Combination Table is the workhorse of the industry. Perhaps the strongest drafting table on the market, this Mayline Ranger Steel Four-Post Table is the workhorse of the industry. Mayline Vertical File Clamp 18"
Perhaps the strongest drafting table on the market, this Mayline Ranger Steel Four-Post Table is the workhorse of the industry. Ideal choice for economical, mobile filing of active documents. Rolling Stands: Constructed of tubular steel finished with an electrostatically applied high solid polyester paint. Mayline Vertical File Clamp 24"
Mayline Vertical File Clamp 30"
Mayline Vertical File Clamp 36"
Mayline Vertical File Clamp 42"